Make no mistake. Giving away books is hard work. It requires planning, teamwork, persistence and a lot of luck. Here are some easy steps to maximize your chance of success. Enroll book in Amazon Kindle Select program. Select the dates your book will be free. I personally do not mind the day of the week, but rumor has it that Wednesday through Friday is the best. I guess, it's hump day, people get bored at work, and scour the 'net for free books? Since my goal was to rise up in the Free rankings as high as I could, it did not make a difference which day I selected. The rankings are relative to all the other books that were free. So, if Wednesday is a popular day, it would likely also have more competition. Try to get at least five reviews before going free. Ten is even better. Some promotional sites will not feature you if you have no reviews. Also, readers like to see a few reviews before downloading. Contact paid promotional sites for book exposure for the days after you come off free. Why? Because after you come off free, your paid ranking will have tanked, and if you do not get promoted, your paid sales may not recover. More on this later. Sign up bloggers or friends for guest posts and interviews during your free days. Have them mention at the end of the post or interview that you are free. Do not announce your free days too early because you will kill sales. Go to my Promo Page and enter your book. Most of the sites have no guarantee that they will select your book, so enter it everywhere. Site owners have become more selective in the books they will feature. Make sure your cover art and book description are as attractive as possible. Some sites ask you to pay to guarantee placement. Everyone's opinions differ, but in this competitive day when tens of thousands of books are free, this may make sense if you're not sure you'll get picked up by any of the free listing sites. Visit the World Literary Cafe and find out how their Tweet Teams work. You don't need to join now, but familiarize yourself with the rules and mechanics. Contact Facebook page owners about listing your book free. See my Promo Page, Indie Author Resources Facebook List and G.E. Johnson's book Get Connected: 101 Places to Promote Your Books Online . Some of the owners will gladly add a post for you whereas others will tell you to post yourself on their page. Facebook has recently reduced the visibility of posts from Fan Pages so the owners are glad if you can post and ask your friends to like your post. Unfortunately, the value of Facebook posts is diminished because Facebook wants page owners to pay to promote a post, so your post is less likely to be seen and hence less likely to go viral. Facebook has also started removing posts its algorithms deem as spam. I had a page owner tell me to "like" my own post immediately before Facebook removes it. Decide how much time you want to spend here and beware that you space out your posts. Facebook can put you in "jail" and suspend your ability to post if it observes too much activity from you. Go to the WorldLiterary Cafe and find the Free Book Forum. Post your book in the dated forum. Go back to the Promo Page and look for the few sites that require you to post only on the actual day you are free. Join the World Literary Cafe Tweet Team and sent tweets announcing your free book. Go to the Facebook Page list and post your free book link on pages and groups that are friendly to those types of posts. Always observe and see if others are doing the same thing. You don't want to alienate groups that do not allow book links and freebie announcements. Publicize your blogger friends' guest posts and interviews on all social networking sites. Do not skip this step. Many authors have found that even though they've given away thousands of books, they did not sell many books afterward. The purpose of the free days is to increase the exposure of your book in terms of name and cover recognition. Everything you did in Steps 1-5 was geared toward pushing your book up the Free chart. Since Amazon displays the Free chart for each category right next to the Paid chart, you get extremely valuable real estate if you do climb the chart. However during the time you were free, you weren't selling ANY books. Obvious, right? Therefore immediately after free, your paid ranking will start at the bottom and you must climb back to where you were before. If you do nothing after coming off free, you will not get the benefit of the increased exposure and attention translating into paid sales. The two promotions I used after coming off free were World Literary Cafe Book Buzz or what they call Social Media Book Buzz and World Literary Cafe Today's Hot Titles. Both of these promotions gave me front page status on the World Literary Cafe, as well as tweets from all of the people using the Tweet Team for those days. For advice on how to locate effective promotion sites, please see my post Promotion, Schuhmotion, Where Should I Place my Ads? 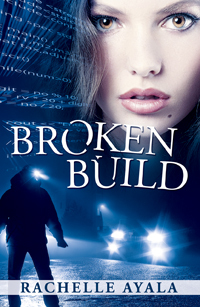 Broken Build (Silicon Valley Romantic Suspense) was free on Amazon on Oct 8-10, 2012. Here are the results. Free Ebooks Galore - the page owner features a different genre each day. Romance happened to be on Wednesday and the owner added me even though I contacted her on Tuesday. This graphic shows the effect. After coming off free, my paid rankings peaked at #605 overall, #5 Technothriller and #25 Romantic Suspense. 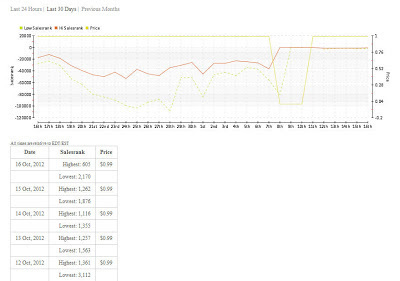 In the seven days after free, I sold 595 and had 49 borrows. My first book, Michal's Window, enjoyed a sympathetic sales jump during the days Broken Build was free. Not only did Michal's Window triple its daily sales at Amazon, it also jumped at Barnes and Noble. I'm very happy with my results and the increased exposure my book has gained through the Kindle Select Free promotion. Yes, we are awash with free books, and I must admit that I spent quite a few hours scouring other freebies. I must have downloaded over a hundred books during the three days my book was free, including a book on Crochet squares and another one on Recipes for Thanksgiving Leftovers. While others were watching the forgettable debates, I was a downloading away and lipsyncing to Donna Summer disco days. Don'tcha just love those Free Books? Do you want to download? Now, don't you ask yourself who reads 'em? Clare, one of the things I love most about you is your ability to organize and remember exactly what you have done so you can quantify results. Thank you for sharing that information here. I'm in awe of this because...well, you know...I stink at keeping stats:-) lol. Congrats and I'm honored to have been mentioned. Thank you for offering your personal support and teaching us. And those are amazing stats! I'm so happy that it went so well! Hey Rachelle! This post has so much amazing information! Question: What paid promo sites do you recommend for after your free days end? I obviously haven't tried them all, but WLC is a good place to start. Do you think the risk of those 1 and 2 star reviews that always crop up after free days is worth it? Also, have you ever considered just trying the paid promotion without going free first and seeing what happens? As always, thanks for sharing and helping us all learn. You are amazing! Hi Chantel, one and two star reviews come with the territory of increased exposure. I don't have the budget for multiple layered paid promotions that hit enough eyeballs as a Kindle Select Free promo does for me, so I'm happy with the numbers I reached. Wow! Thank you for sharing all this. What an incredibly helpful post. Rachelle, thank you so much for sharing! It's awesome information and a great resource! Sheila, thank you for sharing Rachelle's post! I saw your sales stats pre and post FREE, over on KB... congrats! Hi R.J. Thanks for your help featuring my book. Thanks a lot for this fascinating report. I noticed that 'Broken Build' is currently ranked around 133,000. Do you think giving away tens of thousands of copies has anything to do with this? Why is the book currently so low ranked? Do we have to worry about the long term effect of freebies on a book's shelf life? Hey Damian, the times have changed! Free giveaways no longer work, and yes, the book is probably on tons of kindles already. The current ranking is even worse, but it did introduce me as an author to a lot of people, so that my newer releases have had much better success. Thanks for asking.